Product: iBaby M6S video monitor review /baby monitor w ith phone app! iBaby Monitor M6S is one of the most remarkable video cameras on the market today, used for monitoring your baby anytime and anywhere and works as a guardian in taking care of your baby as he or she rests or sleeps. This device has got the extensive high-quality video stream resolution of 1080p and can be controlled by a Wi-Fi connection. This baby monitor is in my opinion one of the best baby monitors with a phone app, which is downloadable in the App Store and Google Play. It has sensors which detect and help in controlling the temperature and humidity of your child’s room, coupled with the ability of an Air quality testing (8 kinds:- formaldehyde, benzene, carbon monoxide, ammonia, hydrogen, alcohol, cigarette smoke, perfume) …..impressive stuff. 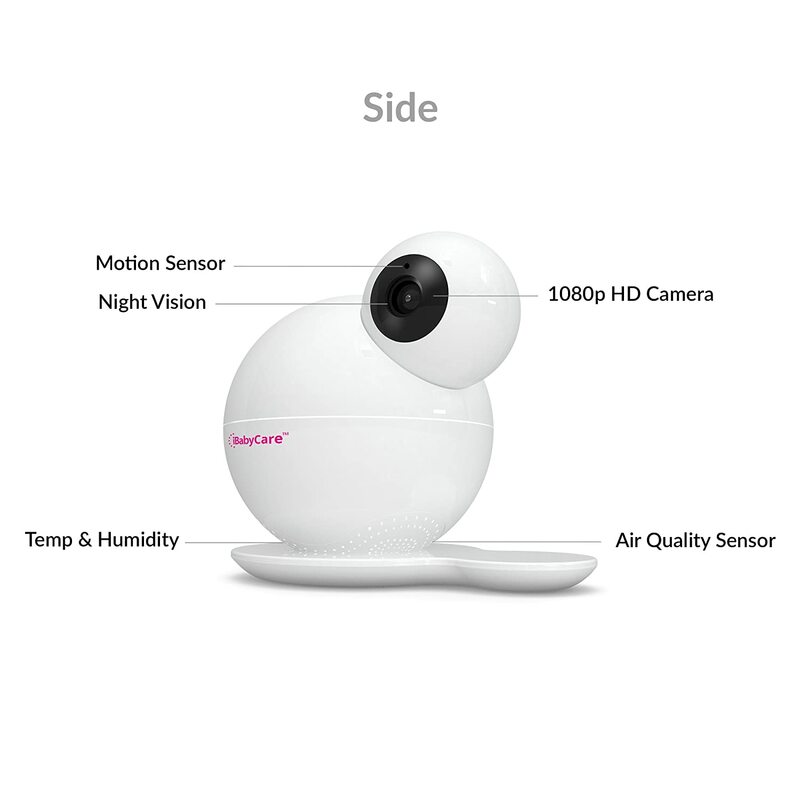 The iBaby Wi-Fi baby monitor camera has an additional feature of HD night vision. There is motion and sound detection and you will receive alerts to your parent unit if your little one makes a noise or moves. This can also be setup to receive alerts direct to your smartphone. It is compatible for two directional audio communication and the newest version, the third generation can also detect air quality! Through the iBabyCare app you are able to view and record your baby – anywhere and anytime! This wonderful little app not only allows you to record videos you can make photo’s, a great way to catch perfect moments you can treasure forever! It is a baby monitoring camera which delivers the best HD live video stream having a sharp resolution of 1080p. iBaby Wi-Fi baby monitor camera has got an outstanding video quality which is not found usually on any other monitoring camera. You even get the best imagery at night because of its automatic night vision capability and can save a lot of precious moments of your baby on free cloud storage. The camera of the device rotates with an angle of 360 degrees, where wide camera angle lens makes a tilt of 70 degrees for each complete one revolution of the camera. Now, you don’t have to worry about the bandwidth of your router. iBaby Monitor M6S can support the dual band routers and can be driven on both frequencies of 2.4 GHz and 5GHz. You can select any of these frequencies depending upon your requirement. There are a few parameters which should be monitored to ensure the best environment for your baby as they can affect your baby’s health. It is important to monitor the temperature, air quality and humidity of the room in which your baby lies. You can do this with the iBaby Care app which comes with the iBaby M6S Monitor. This app generates the graphs exhibiting the trend in these factors on daily, weekly and monthly basis. iBaby MS6 has a proper setup which you can use to set the alert warnings whenever you need. The device will send you a notification on your smartphone and tell you if there is anything unusual happening by detection of sounds or movements around your home. You can also invite your family members or friends to come and use the iBaby Wi-Fi baby monitor camera. Firstly, you have to download the baby monitor app and get yourself registered there using your email address. After this, you can invite anyone by setting your account. This camera comes in the form of the baby monitor with phone app which can be shared with anyone you like while still being able to set the privacy of the device. This state of the art baby monitor brings a very impressive array of features to your fingertips via a mobile app. If your after a high tech baby monitor with amazing capabilities and a modern way of monitoring your baby this is the one for you! I wrote a piece about the iBaby care M6S at the beginning of the year wondering if this could be the best baby monitor of 2017, I think this is the leading contender so far.